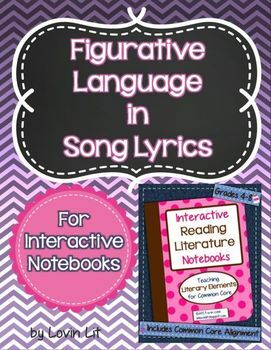 Figurative Language Lessons for Interactive Notebooks - These 9 lessons are perfect for introducing or reviewing these types of figurative language with your students: simile, metaphor, personification, hyperbole, alliteration, onomatopoeia, idiom, and allusion. This product includes Lessons 11-19 from my TpT #1 Selling Interactive Reading Literature Notebooks. Please DO NOT purchase this product if you have already purchased my Interactive Reading Literature Notebooks! At the request of buyers who wish to purchase only this portion of the notebook, I have extracted these lessons (Lessons 11-19) to make a separate product. This product does not include any content that is not in the Interactive Reading Literature Notebook. 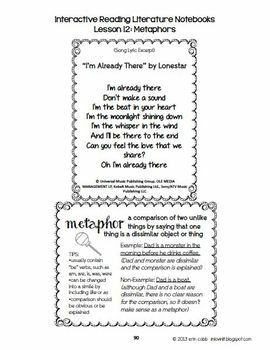 This product includes 1 lesson for each of the 8 types of figurative language - simile, metaphor, personification, hyperbole, alliteration, onomatopoeia, idiom, and allusion. Each of the 8 lessons includes a definition card and song lyric excerpt for students to annotate in their notebook. I have included the annotations for you in photos of completed pages so that you don't have to figure that out for yourself. 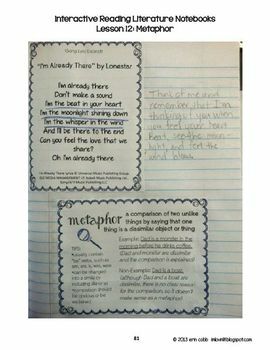 The annotations include identifying figurative language and/or explaining the meaning of the figurative language. Lesson 19 is a sorting activity where students will put the correct sort card inside the pockets (made from definition cards) on the pages they have made for each type of figurative language. 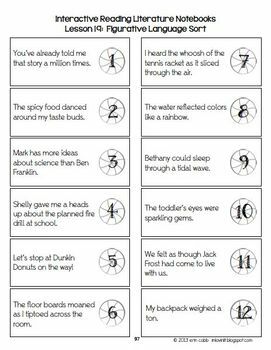 Lesson 19 is a review that wraps up the unit of figurative language.